O.M.G. Let the deep digging and soul searching for my inner poet begin. If you registered too, let me know through a comment! See you at the Commons! Writing 201: Poetry is a two-week course that lets anyone who dabbles in verse (or wants to start) practice the poet’s craft with a supportive community of like-minded bloggers — learn more about its structure and topics! This session runs from Monday, October 5 through Friday, October 16 and has been updated since we last offered it, so folks who joined us last time can find fresh inspiration. I have never considered myself a writer, but after this workshop I feel I can consider writing, writing more frequently, and perhaps with more ease. How do Blogging U. courses work? 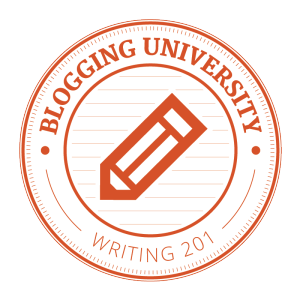 Blogging U. courses exist for one reason: to help you meet your own blogging and writing goals. Courses are free, flexible, and open to all.